Everyone wants to be close to nature, but no one wants to get muddy. How else do you have luxury retreats such as glamping that bring you right smack in the middle of nature while still having all modern amenities like flushing toilets and a made-up bed of 500 thread count Egyptian cotton? But glamping is so two years ago — there’s another type of retreat that brings you even closer to nature now. Introducing the bubble hotels. The concept is exactly as it sounds — guests stay in a transparent, dome-shaped cabin that gives you a seamless view of nature outside. Imagine lying in bed and having an unobstructed view of the stars, northern lights, and more. That certainly brings the adage of “sleeping under the stars” to a whole new level, literally. The best part is that these bubble hotels are scattered all around the world, giving you the chance to experience any type of views you wish: from the barren desert to the aurora borealis, a snowy forest, and more. Choose from our top favourite bubble hotels around the world below. How best to experience the northern lights? From the comfort of your bed in a bubble hotel, of course. Buubble calls themselves the “five million star hotel” — simply because you do get to see five million stars when you sleep inside the transparent bubble dome. The cosy domes are located deep in the forest just two hours away from Reykjavik, and they offer four different kinds of curated tours — two in summer and two in winter — to best experience the bubble hotel and its surrounding landscape. Hotels in vineyards usually take on a more vintage and rustic vibe. That is, unless you stay at the Campera Hotel Burbuja. Wake up in a bubble dome to views of the lush vineyard — Valle de Guadaloupe to be exact — and when the night falls, everything darkens and the only thing you can see are the bright stars in the sky. The bubble domes are not just pretty, they’re also eco-friendly, climate-controlled rooms with full-sized beds and en-suite bathrooms. During the day, be sure to take time to visit the many other vineyards nearby. Imagine this: you want to be nestled so deep in the forest it feels as though no one could ever find you, yet you don’t want to be too far from civilisation. Sounds ironic, but that’s what Finn Lough is providing in Northern Ireland. The completely-transparent bubble domes are surrounded by woods, but you’re actually still within the confines of Finn Lough Resort that houses other amenities and chalets. The cosy bubble space has a four-poster bed, plush hotel robe, and even a Nespresso machine to keep you going through the night of stargazing. The Uyuni Salt Flats in Bolivia is one of the most magical places to visit. During the wet season, the bright-white flats fill up with water and reflect views of the sky, blurring the horizon between sky and ground. Come February 2019, you will be able to stay there in Kachi Lodge, the first hotel at the salt flats. The bubble hotel rises up from the ground and provides clear-panelled windows for maximum viewing of the landscape outside. They come fitted with plush double beds and a wood-burning stove to keep you warm when temperatures dip to zero at night. Canada is known for its lush forests and nature — now imagine staying in a see-through cabin in their forests. That’s precisely what Ridgeback Lodge is offering with their Dream Dome and Stargazer Domes. These luxuriously cosy cabins are deep in the middle of a private forest, giving you and your partner that romantic getaway with zero mobile signal. Each dome also comes with a private outdoor wood-fired Japanese hot tub, which will be perfect in the dead of winter. If the futuristic-looking rounded pods on the desert seem familiar to you, it’s because Sun City Camp was inspired by the movie The Martian. 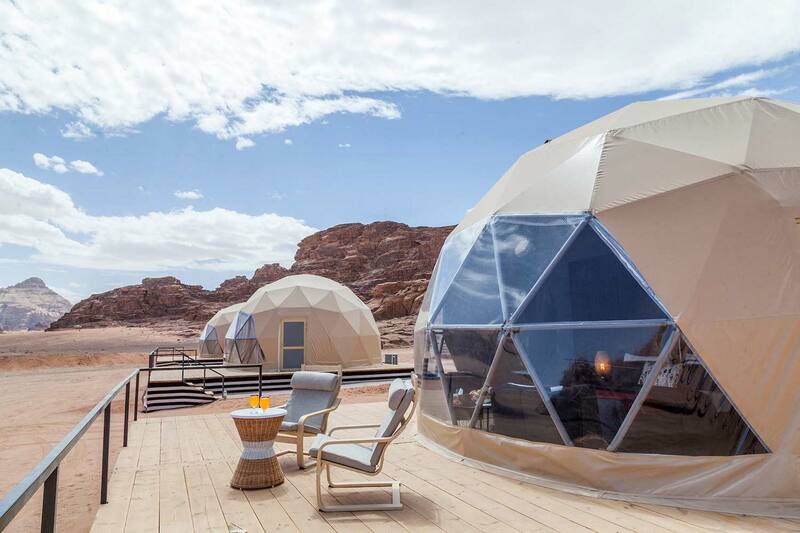 The resort is set amidst the Mars-like landscape of Wadi Rum desert with several villa types to pick from — panoramic mountain view tents, traditional Bedouin tents, and our pick: the Martian Domes. The air-conditioned dome sleeps up to four people. Don’t worry about getting a heat stroke while inside this particular bubble hotel, because it’s not completely transparent. There’s also a private terrace to gaze at the stars outdoors.